I could not stop eating this Tomato Mango Flatbread! 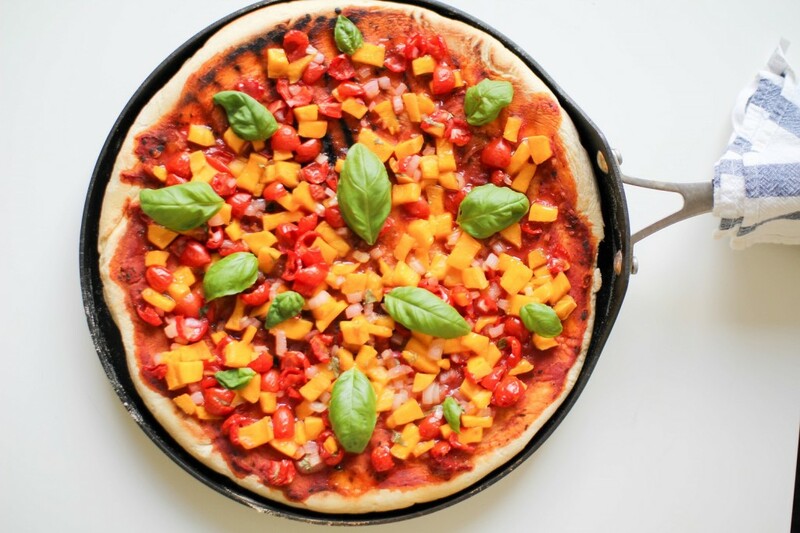 I love the combination of mango and basil so I thought it should go on a pizza, genius! I figured a nice little flatbread would be cute so I used my popular single serving pizza dough recipe. 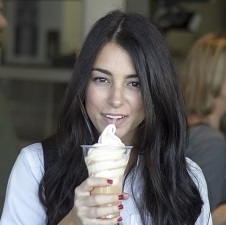 It was so good I wished there were more once it was gone. So the same night I decided to make a whole pizza size worth and pick a movie for movie night with my husband. We love pizza in our house. I think I’ve mentioned this before. We love it so much that we might be considered sick. Since I have been trying to avoid animal products that sadly eliminates pizza for me. Insert sad face. This flatbread was so flavorful I didn’t miss cheese and neither did my cheese-loving husband. 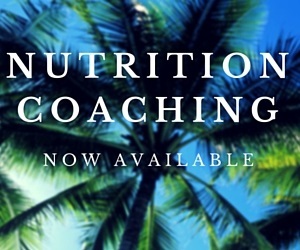 In fact I didn’t think about it until just now writing this post. This recipe makes a small flatbread for a single serving or for an appetizer for 2-3 people depending on how you cut it. If you want to make this for multiple people (and you should because it’s amazing) I suggest making a large dough ball and making 1 large pizza, or divide the dough into smaller pieces for everyone to have their own individual. 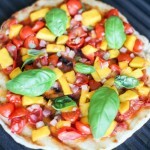 And of course you will want to triple the tomato mango mixture as well. You don’t have to use a grill pan, I just like to because the grill marks makes everything look better therefore taste better. You can also use an actual grill which we have done before you just need to take a few extra steps. 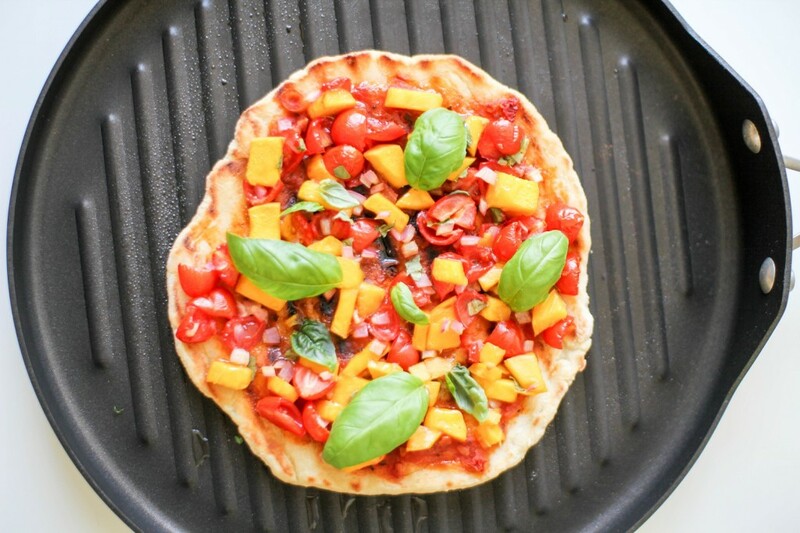 You will want a pan that you can put on your grill to slightly cook the dough so it won’t fall through the grates. Once the dough has firmed up place it on the greased grill grates and let it char, grease the top so it won’t stick once you flip it. Flip the crust and top it. Allow it to cook the rest of the way. Super fancy right? And this is the one I made on the same night in all its glory! We ate almost all of it! There were only 2 pieces left. My husband didn’t even have a chance because I snatched them after the gym the next morning! HA HA HA! 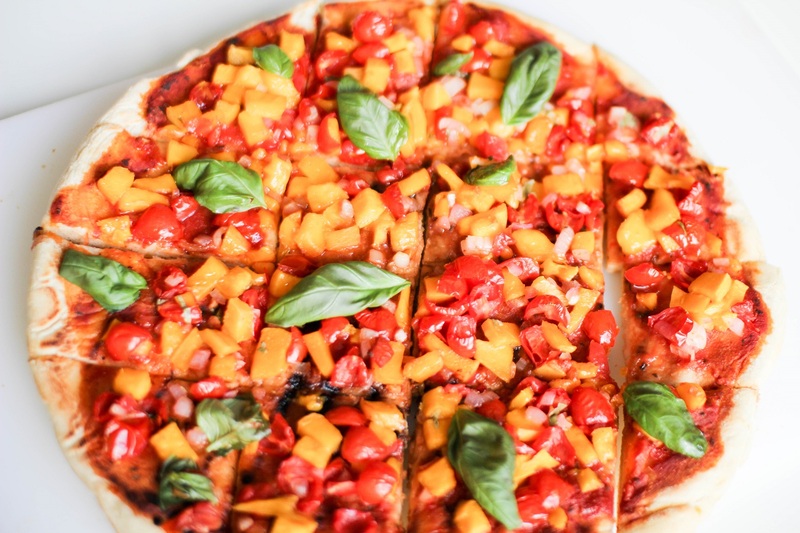 A plant based flatbread with fresh tomato and juicy mango. 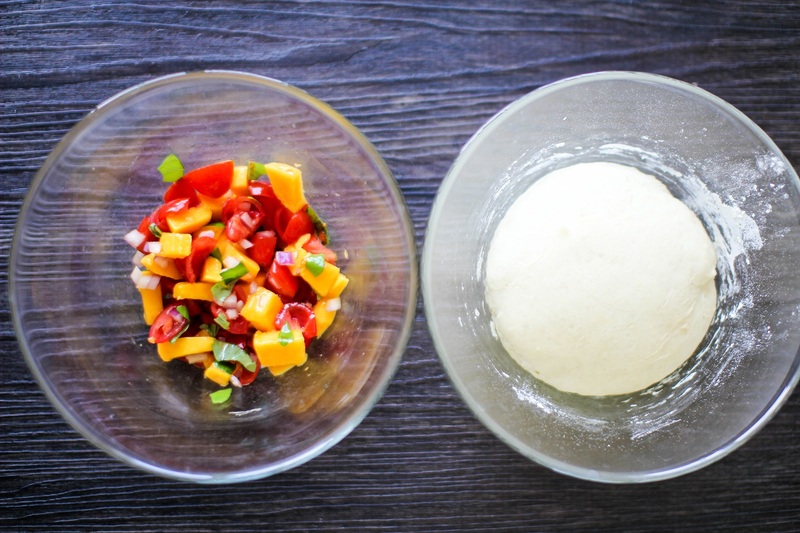 Prepare Recipe Righter's Single serving pizza dough recipe. Slice grape tomatoes in half, then over the sink stick your thumb in them to deseed/depulp them. Cut the grapes in half again and add to the mango bowl. Finely chop ¼ of a red onion and add to the mixture. You can chop and freeze the rest of it to use in other cooked dishes. Tear some basil leaves into the mixture. Add a pinch of salt and natural sugar; this will help bring out the juices. Preheat your oven to 400 degrees and put grill pan over high heat to start getting it very hot. Stretch your dough into the shape and thickness you would like. Spray your grill pan and put the dough onto the hot pan, cook until there are grill marks on the bottom. Take the pan off the heat and flip the dough. 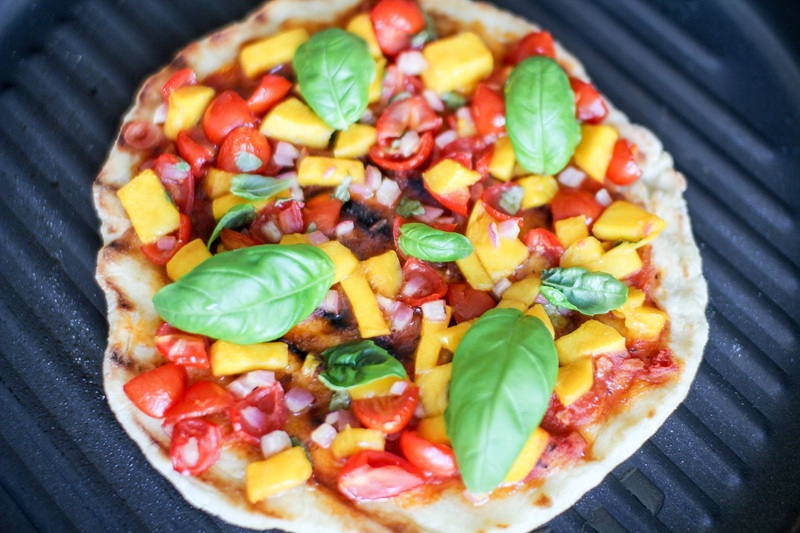 Top the flatbread with your favorite marinara sauce and tomato mango mixture. Finish the flatbread in the preheated oven for 10 more minutes. 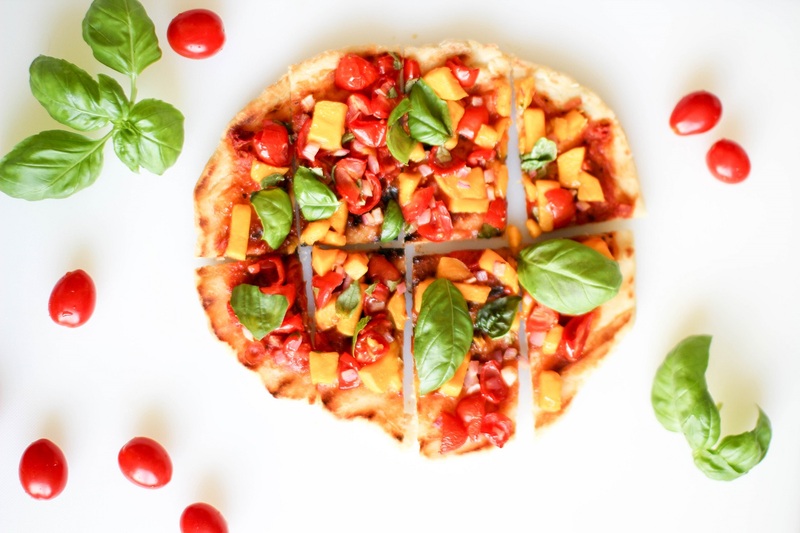 Give it a light drizzle of olive oil and garnish with fresh basil leaves.